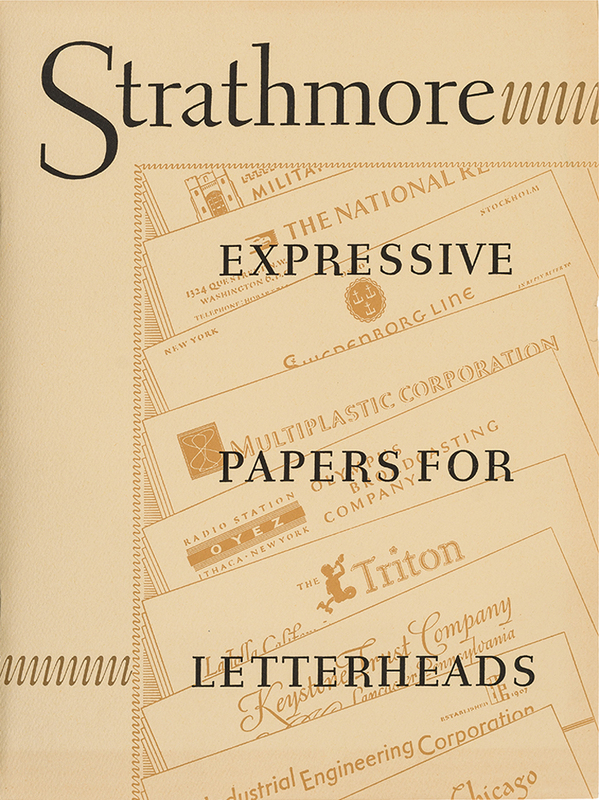 Strathmore Expressive Papers for Letterheads portfolio (Strathmore Paper Co., 1950). Design by Rudolph Ruzicka. Photograph by Vincent Giordano. 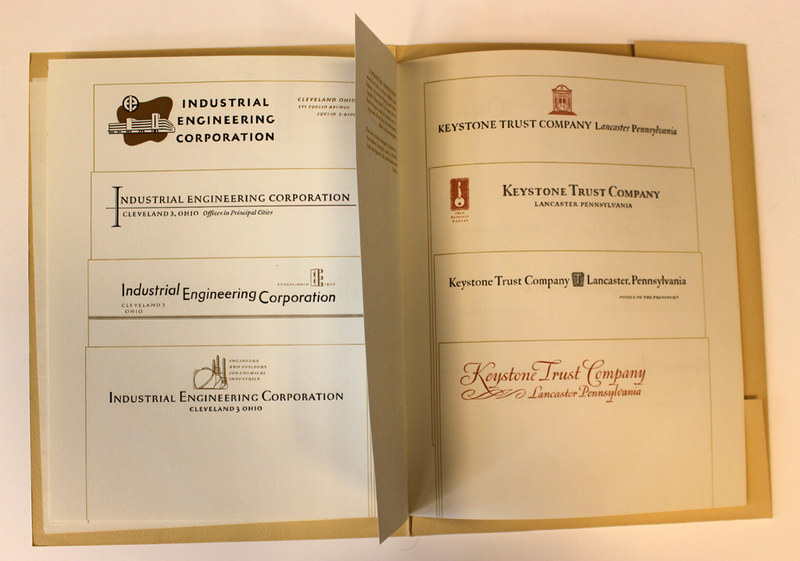 Spread from Strathmore Expressive Papers for Letterheads (Strathmore Paper Co., 1950). All designs by Rudolph Ruzicka. Strathmore’s 1930s preference for illustrations on the covers of its swatch books continued in the postwar era, but fashions had changed. Gone were the flat, crisp, stylized drawings of the Art Deco/Art Moderne era. Now the drawings were looser, more figurative. Scripts replaced sans serif lettering. Richard Bartlett (1900–1987), a painter known for his scenes of Cape Cod, was responsible for several of the new swatch books between 1947 and 1953: two versions of Strathmore Beau Brilliant and one each of Strathmore Pastelle and Strathmore Saxon. 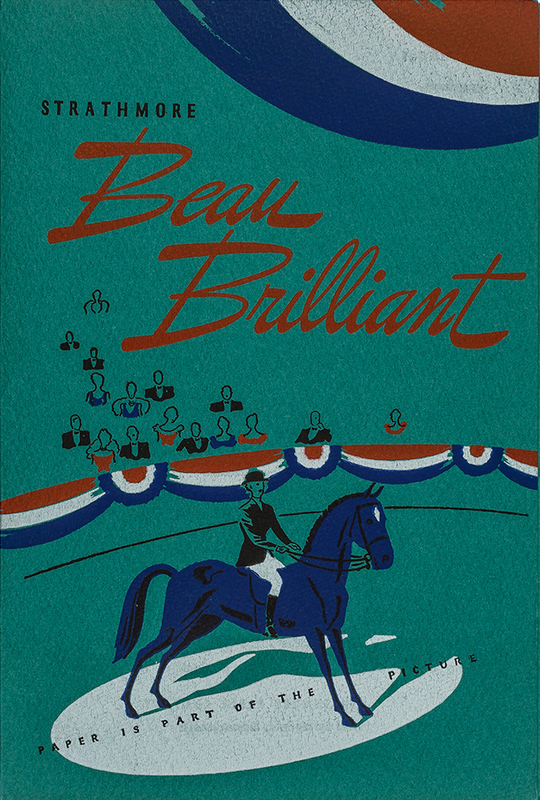 Strathmore Beau Brilliant swatch book (Strathmore Paper Co., 1947). Design by Richard Bartlett. Photograph by Vincent Giordano. 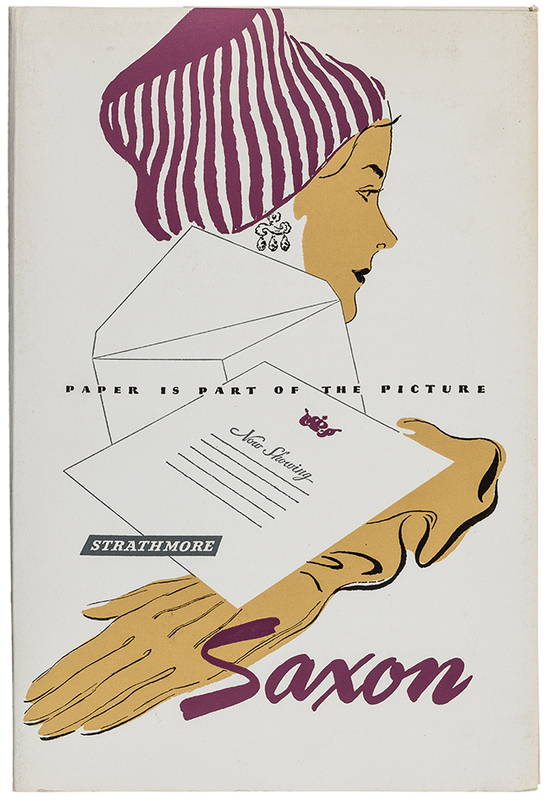 Strathmore Saxon swatch book (Strathmore Paper Co., 1949). Design by Richard Bartlett. Photograph by Vincent Giordano. Strathmore Pastelle swatch book (Strathmore Paper Co., 1952). Design by Richard Bartlett. Photograph by Vincent Giordano. There have been only a few women involved in Strathmore’s paper promotions. One of them was Cornelia J. Hoff (b. 1904) of whom little is known. An online search turned up a number of references to children’s books and mathematics textbooks that she illustrated at the end of the 1920s and into the 1930s for Ginn & Co.; and in the 1940 United States census she described her occupation as commercial artist. For Strathmore, she was a designer as well as an illustrator. 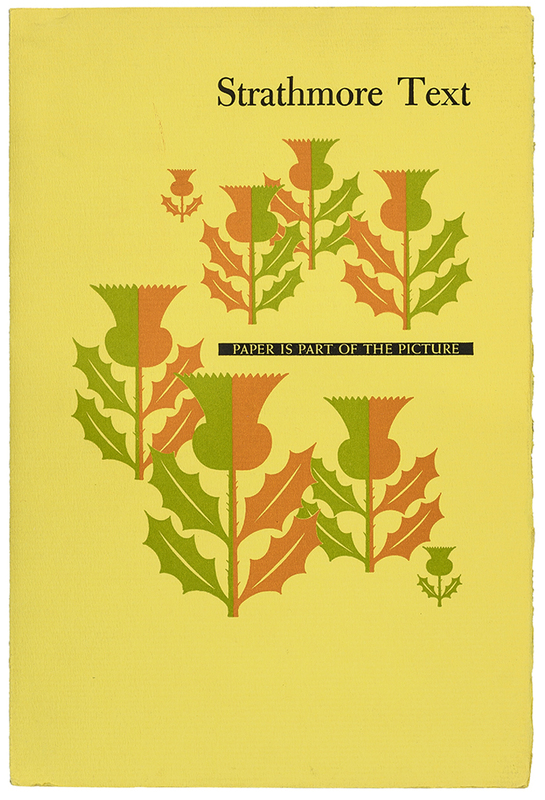 During the war she designed several streamlined thistles that were used on packing labels and packages. And in the 1950s she was responsible for the formats of the first two color-coded Strathmore swatch book lines, both of which used abstracted thistles as a repetitive and unifying element. Unfortunately, lack of space in the case devoted to the 1950s made it impossible to include Hoff’s work in The Opalka Gallery exhibition. This post is an attempt to remedy that oversight. 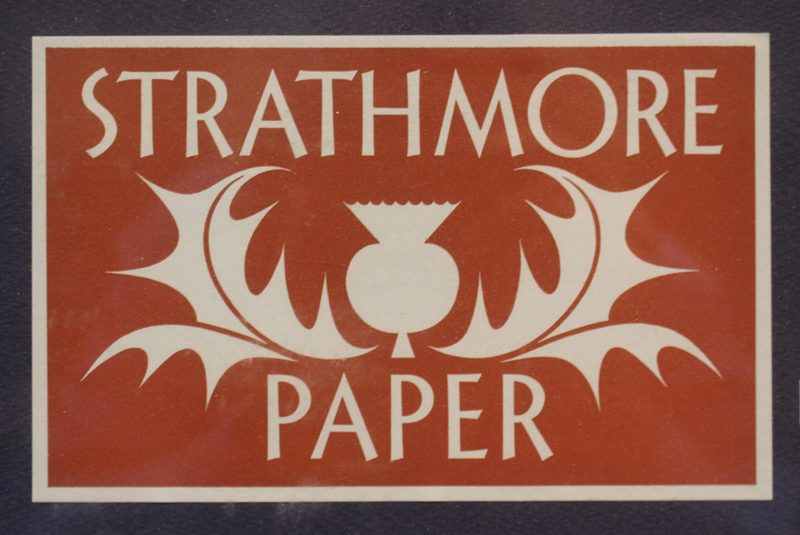 Packing label for Strathmore Paper (early 1940s). Design by Cornelia Hoff. 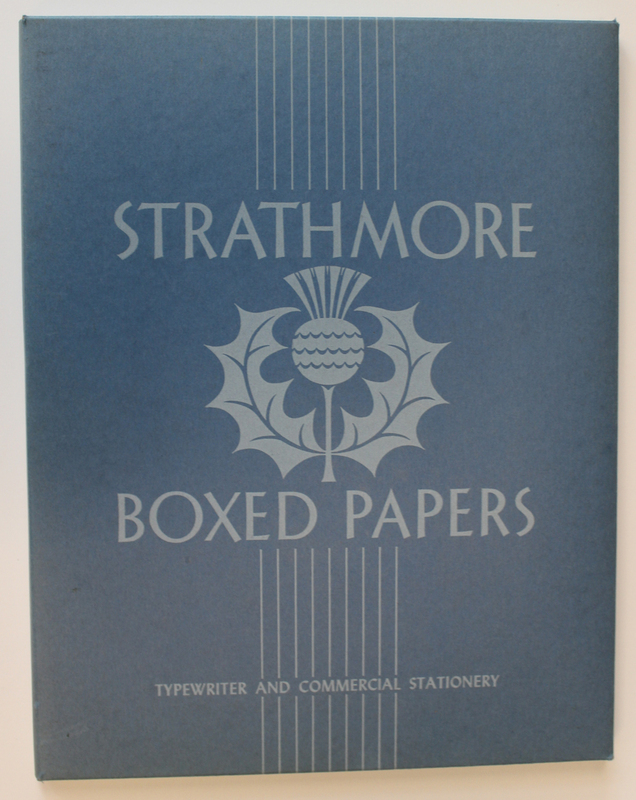 Strathmore Boxed Papers (c.1945). Design by Cornelia Hoff. 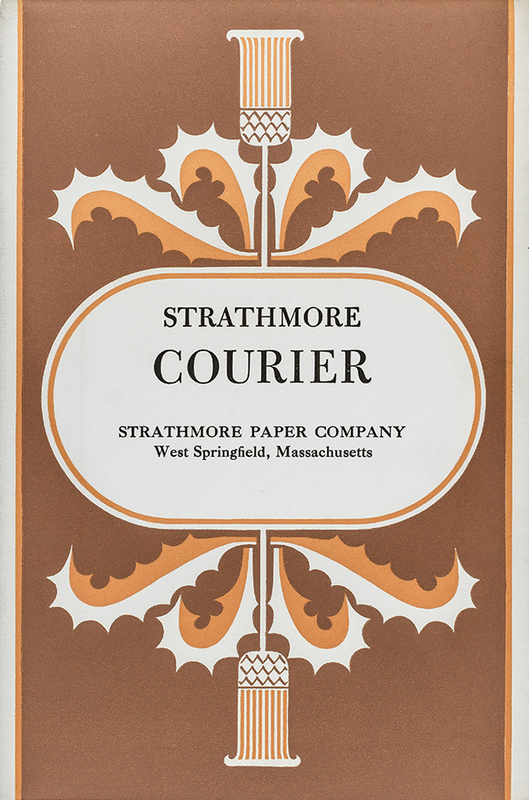 Strathmore Courier swatch book (Strathmore Paper Co., c.1953). Design by Cornelia Hoff. 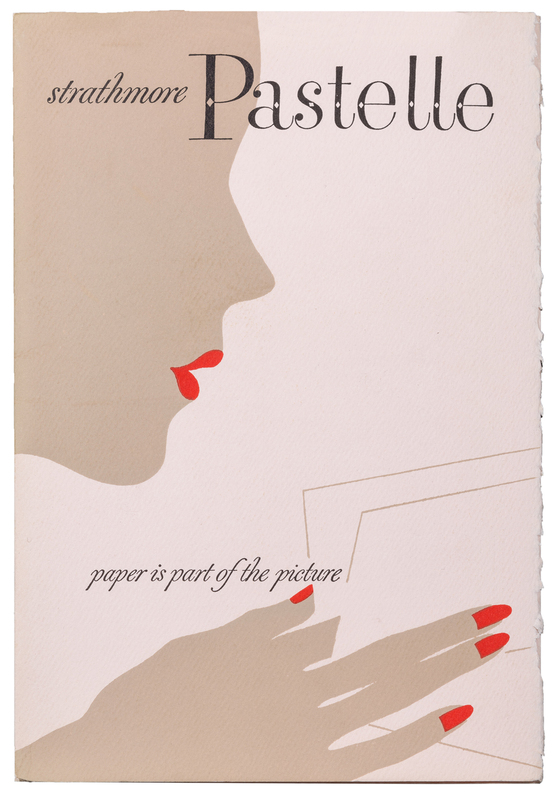 Other paper lines used the same stylized thistle but were distinguished by different colors. Photograph by Vincent Giordano. 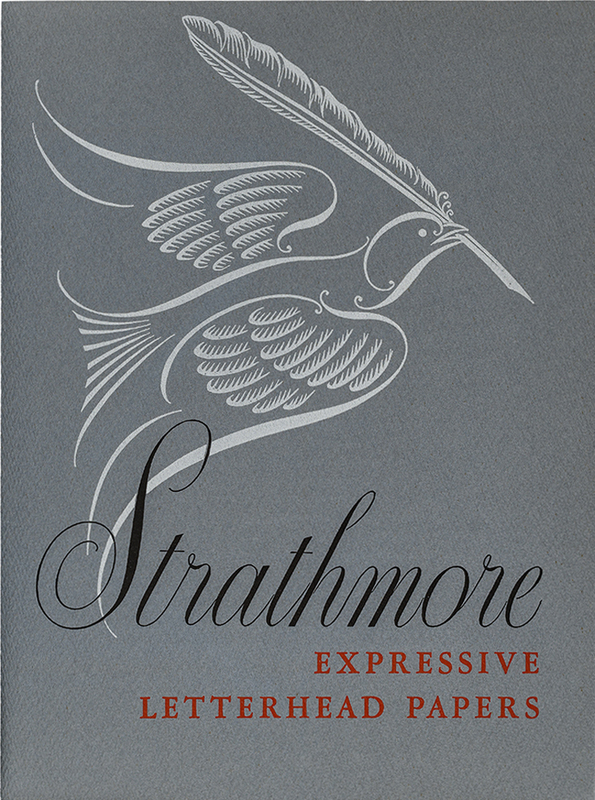 Strathmore Text swatch book (Strathmore Paper Co., late 1950s). Design by Cornelia Hoff. Other paper lines between 1957 and 1962 used the same thistle arrangement but with different color combinations. Photograph by Vincent Giordano.